Quito is the capital of Ecuador . With 2.2 million inhabitants is the second most populous city . It is located in the Andean valley , at 2800 meters high, on the green slopes of the Pichincha volcano. Quito has the largest and best preserved historic center of America. In 1978 it was declared a World Heritage Site by Unesco. You can visit the hill Panecillo ( a natural viewpoint of the entire city ) , the cable car that leads to the moors of Pichincha at 4,200 meters, the monument to the Equator in the Middle of the World and a variety of museums and parks. Stay in Quito and at home . 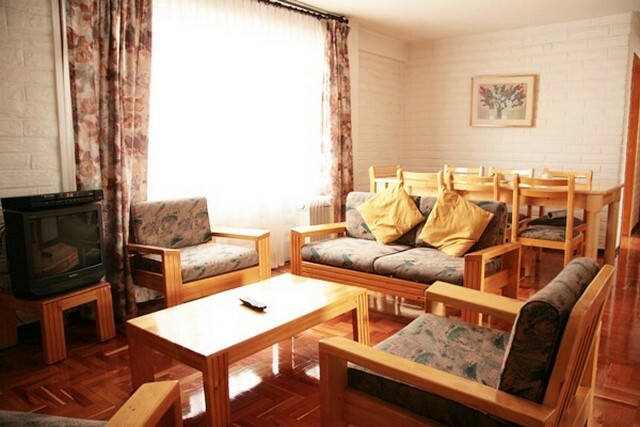 Apartments Los Quipus offers 9 apartments with one or two bedrooms , kitchen, living room with fireplace and TV , kitchen , dining room and bathroom with tub. Many guests require for a median duration of stay more homely atmosphere of Los Quipus , the option of cooking something and flexibility to adapt the space with furniture suitable as a baby bed or a desk to work . Each apartment adjoins gardens and terraces, or has its own balcony . Apartments Los Quipus is located in the traditional neighborhood " La Floresta " , near the historic center and the modern area . A short tour takes you to the best restaurants, bars and shops in the city . We serve meals in our restaurant buffet breakfast , lunch and dinner on request . If you prefer, you can shop and cook in your apartment . In addition, the reception can help with food orders (delivery) . Free Internet access in all areas . Covered parking in the hotel parking is available upon request. Laundry We provide laundry service for normal clothes . Office has fax, computer, printer and reception of messages. Designated smoking in the outdoors when no cause inconvenience to others is permitted. In indoor public spaces and the apartments smoking is not allowed . Prices are in US Dollars . They include all taxes . It does not include food or other consumption . Cash payment forms . timely bank transfer. Credit cards: Visa , Diners and MasterCard. Taxes and expenses VAT ( 12%) and services ( 10% ) are included in the price. Cancellation If you need to cancel your reservation, please do so in time : You can cancel without charge up to 7 days before arrival. If the cancellation is made less than 7 days before 10 % of the total booking value is charged. If you do not come and not canceled is charged 30 %. Arrival and departure Check in from 14:00 AM. Out until 11:00 PM. Exceptions on request .